This is a view of the main gallery of the National Museum Of Scotland in Edinburgh. As you can see, the building is very light and airy. And rightly so, because the building has become a museum piece in its own right. The building is loosely modelled on Crystal Palace in London – the building that was the temporary venue for the 1851 Great Exhibition. The 1851 ‘Great Exhibition of the Works of Industry of all Nations’, to give it its full title, was designed to show the power of man to forge and form the world to his design. And the United Kingdom as the greatest imperial power, was in the middle of a love affair with its conquest of the material world. And this ‘new’ design principle shows in the architecture of the National Museum of Scotland in Edinburgh. The architect of the National Museum of Scotland was Francis Fowke, who took his inspiration from the design of Crystal Palace in London. Fowke was just 42 when he died, but he left his mark on an amazing number of buildings including the Royal Albert Hall, parts of the Victoria and Albert Museum, and the Natural History Museum – all in London – and the National Gallery of Ireland in Dublin. As a side note, Crystal Palace was built in Hyde Park in London to house the Great Exhibition. It was built with a glass roof and glass walls around a cast iron structure – hence ‘crystal’ palace. It was never intended to remain permanently in Hyde Park and in 1854 it was moved to a new site in south London. The exhibits from the Great Exhibition were then moved to the Victoria and Albert Museum (V&A) in London, which was built in 1857 specifically to house the exhibits from the Great Exhibition. And so things continued until Crystal Palace burned to the ground in 1936. From the outside, the building has a stone-clad facade typical of Edinburgh architecture. It is the interior with its tall, slim cast iron columns and a glass roof that reflected Victorian pride in the conquest of new materials. Unfortunately, cast iron rots. So when the museum was renovated n the 1990s some of the columns were replaced with stainless steel. They are all painted, so you can’t tell which are which by looking. Among the exhibits on view we can see in the photograph a whale’s skull just to the left of the two people standing talking on the ground floor. And just up from that is a section of the particle accelerator that was used at Edinburgh University in the 1950s and 60s to break atoms apart. In the foreground is the glass lens from the Inchkeith lighthouse in the Firth Of Forth, in use until the 1980s. And up on the first floor on the left is the all-important cafe. There is a lot more to the museum off to the right of what you can see in the photograph and also behind the camera, as it were. The light levels in the other rooms are low to protect the exhibits, and stepping from the main galleries into those rooms, they seem even darker until your vision adjusts itself. Tamara and I have seen some terrific exhibitions here in the past two years. Viking ornaments, mammoths, and Egyptian mummies, to name just three. They have been wonderfully curated and are true educational experiences. So if you are in planning to be in Edinburgh, find out what is on – you are not going to be disappointed with the exhibitions the museum puts on. The museum can vie with the best for the number of names it has had throughout its history. It started life as the The Industrial Museum Of Scotland. A decade later it was renamed as the The Museum Of Science and Art, only to be renamed as the Royal Scottish Museum in 1904. With reorganisation in the 1980s it was amalgamated with the National Museum Of Antiquities (then housed in the National Portrait Gallery) and renamed the National Museums of Scotland (note the ‘s’). Then in 1998 the new Museum Of Scotland opened next door to the National Museum. This is the new building – purposely built to look like a defensive fortification. And to the left of the frame you can see part of the National Museum. Then in 2011 the Museum of Scotland was knocked through to connect to the National Museum and the whole museum was renamed yet again – this time as The National Museum Of Scotland. Yes, it is all very confusing and quite homely and appealing. My thanks to Donnie McCathie of of National Museums Scotland who points out that contrary to what I said in this article before this correction – National Museums Scotland does not include the two buildings of the Modern Art Museum on the edge of the city. They are in fact part of National Galleries Scotland. 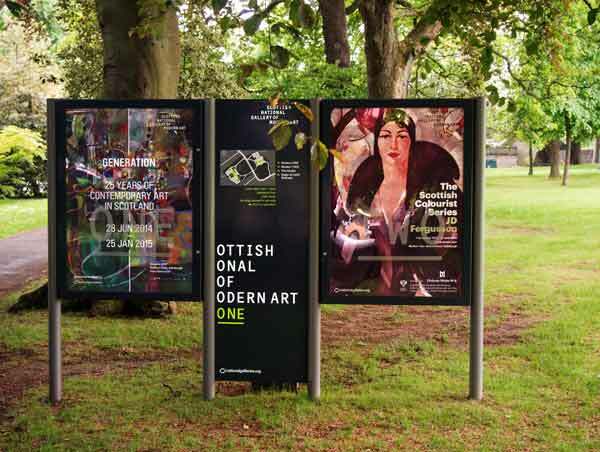 The ‘ottish onal of odern art one’ wording is not an error. This is the sign for The Scottish National Gallery Of Modern Art One. Modern Art Two is across the road, with its corresponding half of the complete sign. It makes perfect sense for a modern art museum to break the rules, but I wonder what foreign visitors make of it? Thank you so much for this delightful post. 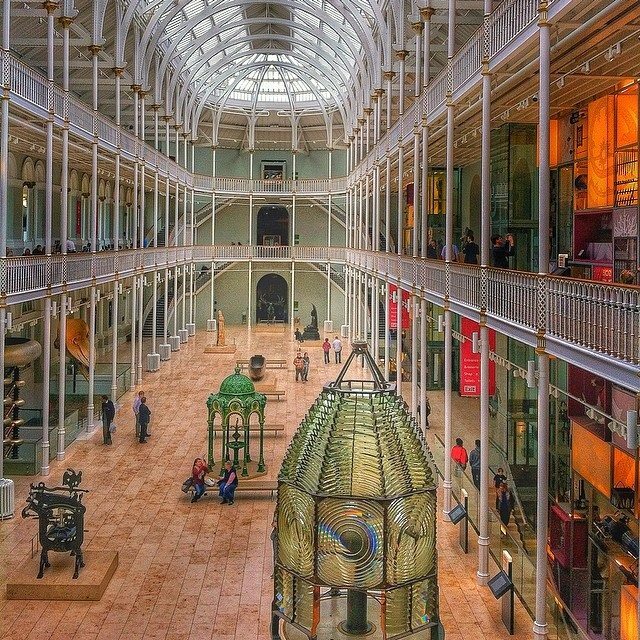 Should I ever get back to Edinburgh (my only sojourn there was more than 40 years ago), I will definitely go to see these museums. 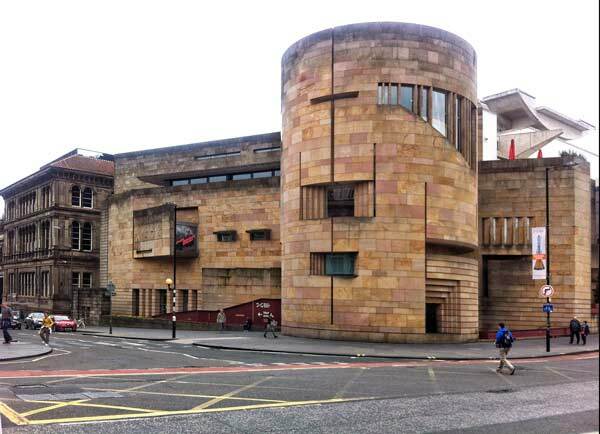 ‘National Museums Scotland’ includes the two buildings of the Modern Art Museum on the edge of the city – Nope! this is not true!! The modern art museums are most definitely not part of the National Museums Scotland group. those covered under that umbrella are: The National Museum of Scotland, The Museum of Flight, The national War Museum (in Edinburgh castle) and finally the Museum of Rural Life. Thank you for this and I wonder how I could have been so dumb as to say differently. I will correct the article. The National Galleries is, however, a group, including apart from Modern One and Modern Two as mentioned, plus the Portrait Gallery on York Place, and of course the Scottish National Gallery (which comprises both the National Gallery Building on the Mound and the Royal Scottish Academy Building on Princes Street).